Just after my book, Elvis’57: The Final Fifties Tours, was published in 1957, Nostalgia Magazine, a Spokane based publication about the city’s history, asked readers who had seen Elvis perform in Spokane in 1957 to send in their memories of the event. Seeing a chance for some publicity for my book, I contacted the editor of the magazine and suggested he run an excerpt from my book in Nostalgia. Apparently at about the same time, Gaylene Pope of Wenatchee, Washington, had written down her memories of meeting Elvis in Spokane in 1957 and e-mailed her story to Nostalgia’s editor. In the August issue of Nostalgia an excerpt from my book about Elvis’s Spokane concert 50 years before was published. For some reason, Gaylene’s e-mailed story never made it through to the magazine’s editor, and so it was not printed along with the other Elvis remembrances that had been sent in. 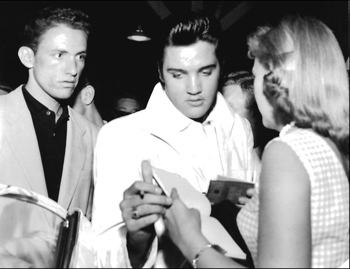 Below is Gaylene’s lost story of meeting Elvis in 1957. 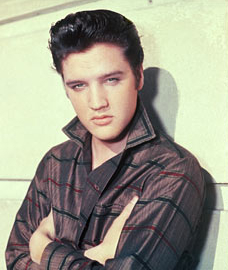 Yes, I was at the Elvis Presley concert on August 30, l957. In fact, my father was in charge of the transportation for the Presley troupe during their visit to Spokane. (Howard W. Moos was the Cadillac Manager for Utter Motor Company and head of the Lilac Festival Greeting Committee). My sister and I were both students at Wilson Grade School and Lewis & Clark High school respectively—just learning to dance, and of course “Heartbreak Hotel” and “Don’t Be Cruel” were on the radio/television constantly. The two of us looked at each other in disbelief (!!) and yelled out, “WHAT DID YOU JUST SAY?” Mom and Dad both looked at us, smiling, and Dad then went into the details of what his responsibilities would be while Elvis was “in town.” Parmalee and I immediately went into our bedrooms to pick out what we would wear (presentation you know), and made sure we had our autograph books with us. We had a hurried dinner, and the adventure began. train station on the evening of August 29, 1957. There were several Cadillacs involved—enough for Elvis’ entire group. Dad, my sister and I were in the lead car as we approached the beautiful, big (now sadly non-existent) train terminal. Fans were already on-site waiting for the train to appear—screaming, hollering, yelling, all the excitement you acquaint with an event like this. My sister and I stayed close to our father and the Cadillacs. We knew our location (we were located on a side street location) was the eventual destination for Elvis. When he appeared I know we were in awe as everyone else was. Both Parmalee and I had our autograph books (and pen) in hand. Our mouths must have been wide open—in shock—as we saw him approaching us. Oh my gosh, he’s really coming right over to us. My heart was pounding. I just kept looking at him. His hair was dark black, shiny clean—not greasy. His complexion was beautiful (not greasy). And what a nice young man (!! )—a real gentleman. We both froze—like statues. I finally mustered up the ability to ask for his autograph, at which time he smiled at me, leaned over and kissed me on the cheek, took hold of my hand and nicely said, “I already signed your book, Dahlin’.” I embarrassingly looked down at my book, and sure enough, there was his autograph. He had actually taken the book out of my hand, signed it, and slipped it back into my hand without my realizing it. I was so in shock. (Why couldn’t I have looked cool and in control?) Then I looked over at my sister. Her book was signed too. Now the loading of the cars began. Parmalee and I quickly followed Dad over to the car we had ridden down to the train station in, only to be kindly, but firmly, held back. We were told we would be riding in the “second” car while only Dad, Elvis and his manager, “Colonel” Tom Parker, would travel in the front car. I still remember Dad looking at both Parmalee and me, smiling (knowing we really wanted to be in the back seat of his car) and then watching Dad open up his car door on the driver’s side. 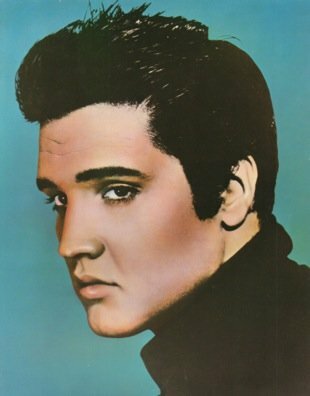 As he entered to sit down in the driver’s seat, Elvis was scooting across into the middle of the front seat, reaching out to shake hands with my father, saying, “Hello, I’m Elvis Presley,” and hearing my father say, “Hello, Elvis, I’m Howard Moos.” The vision of those Cadillacs, all the people—it was amazing. Then we departed—off to the hotel. I keep reminding myself that we were young—definitely thrilled and excited to be a part of this rare opportunity. But I must admit I cannot remember which hotel we took Elvis to. The evening of the concert we did not go with Dad. He was off earlier to pick up Elvis and troupe and get them situated at the stadium. Parmalee and I were driven there with a friend and daughter, who also had tickets to the concert. The concert at Memorial Stadium was amazing—of course!! Our father looked so handsome as he drove Elvis down the ramp in the Cadillac to deliver him to the stage. It was a beautiful summer evening. Thousands attended—as you would imagine—and the wonderful music! Certainly, it was an evening to remember. And now it’s time to bid farewell. Back to the train station—yes, in Car #2. Once again, my sister and I were in a fairly protected area, but in full view of the many Spokane fans. I can still see the train as it started to move. Elvis was standing on the steps of his train car holding onto the side rails, smiling and waving. All of a sudden, a female fan ran up to him, leaped and grabbed onto his neck. The train was moving, she wouldn’t let go, the police were trying to grab her, the train was moving faster, the girl’s boyfriend was running alongside grabbing for her, Elvis looked a bit concerned, and finally, with the help of some other individuals, she let go. The concert, the entire adventure, has always remained a wonderful, special memory for both my sister and me. We have his autograph, but in all the excitement—yes, we had forgotten our camera. So no photograph. But you know, fifty years later, it seems as though it just happened yesterday. Shortly after the publication of the Nostalgia issue with my book excerpt, I received a call from Gaylene Moos Pope, who had gotten my phone number from Nostalgia’s editor. After introducing herself, Gaylene told me how surprised she was to open her copy of Nostalgia and see a picture of her with Elvis that accompanied my book excerpt. It was a picture that for 50 years she never knew existed. The photo was published in the Spokane Daily Chronicle on August 30, 1957, the day of Elvis’s concert in Spokane. For some reason, Gaylene’s family had missed seeing it then. I had obtained a copy of the photo from the newspaper archives and used it in my book. After our conversation, I sent several copies of the photo to Gaylene in Wenatchee. And so, through the conduit of Nostalgia Magazine, an Elvis fan was finally able to obtain visual evidence of a cherished memory from her youth. Making such connections has been a pleasant byproduct of writing my book on Elvis.